Transforming a loft into a cool and interesting office space is relatively simple with the right pieces of furniture and accessories that are both functional and decorative. Less is definitely more when it comes to any working environment as clutter and overcrowded surfaces do not lend themselves very well to creativity and productivity! Think simplicity, functionality, space and inspiration and you are on the right track. Only use items that are either needed in order to work, or are inspirational or decorative enough to add to the creative and cool atmosphere you want to produce. Picking one area to start off with is a good way to begin, so why not initiate your design by starting with the windows? 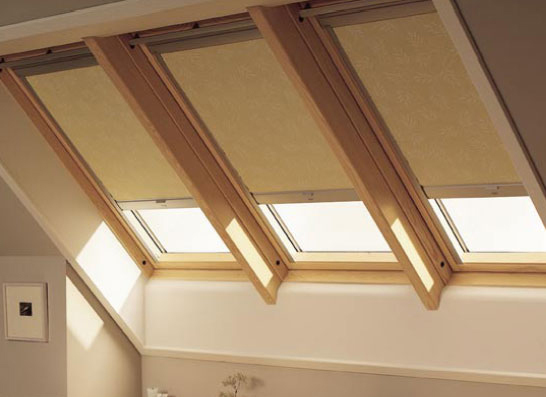 Blinds from Velux Blinds Direct are a fantastic way to spruce up windows and skylights in any loft. They come in a huge array of colours, sizes, styles, patterns, textures and prints and can really bring a lot to any sort of design scheme. Blinds are very suitable for office environments and look great against modern and elegant backdrops or they can even act as the focal point of a room. Sleek and modern and extremely functional, Velux blinds are an effective jumping off point to base your room design around. If you go with an elaborate or colourful blind, then why not offset this with a really cool but functional piece of furniture or two? All offices no matter how big or small, require at least one chair, a desk and a computer as a basic package. But these items do not have to be boring to be effective. Why not opt for a funky swivel chair with a high back in a retro-style print or fabric? This will add instant oomph to any workspace and will really stand out especially against a more muted or reserved backdrop. Pick up the colours of your blinds in your chair as an accent to emphasis the pieces and make a subtle yet effective statement. Desks and work surfaces also need not be mundane whatsoever. There are so many modern and sleek desk units available today for every budget, function and taste so have a look around for one that suits your needs but also appeals to your aesthetic. Try multi-purpose sliding shelf systems and desks with hidden drawers for more storage in compact spaces. Once you have the window dressed and the desk and chair picked out, everything else will fall into place! This entry was posted in Tips and tagged Velux Blinds, window blinds. Bookmark the permalink.